To enrich teaching across STEM (Science, Technology, Engineering and Mathematics) and design subjects, there are innovative ways of using 3D printers as a technology to help teach complex subjects in a much easier way. No doubt, schools are still in the early stage of adoption of this innovative technology, but 3D printer is the exciting opportunities to explore and has the ability to revolutionize the education sector in a holistic manner. The technology not only provides teachers with three dimensional visual aids to use in the classroom in illustrating the methods but also makes it easy for them to seize the interest of the students compared to just showing the pictorial representations of the objects. “3D printers can be used in home, office, lab and there are also required in classrooms today. We are seeing the usage of 3D printers for technical courses. The technology helps in evaluating the ideas, and can design quickly whatever students conceive through practice. The usage improves creativity and innovation. 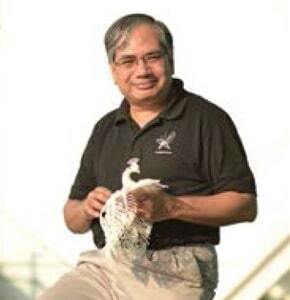 3D Printing can also be used by Medical students,” informs Prasad Rodagi, Founder Director, Altem Technologies. 3D printing technology is turning out to be an effective means for classrooms, where students are undertaking real world learning experiences, be better prepared for tomorrow’s challenges. It nurtures creativity, satisfies intellectual curiosity and inspires students to invent, design and engineer. It encourages new ideas, help them bring it to life, and create objects that model the innovations with high accuracy, fine detail and moving parts. “Through project-based learning enabled by 3D printers, students will be equipped with a solid foundation on 3D printing in addition to enriching their design and engineering knowledge. It fuels limitless creativity where students get to see, hold and test their ideas in real space. Tomorrow’s engineers, designers and problem solvers deserve every tool available to build a brilliant future,” believes Rajiv Bajaj, General Manager, India, Stratasys AP. There’s been a paradigm shift from 2D to 3D globally, and India is catching up fast with global trends. They are envisioning the future by forming a befitting ecosystem in 3D printing. “3D printing will fuel limitless creativity, by allowing students to hold, see, and test their ideas in real space. That said, 3D printers won’t just give them a jump start on tomorrow’s challenges, but will also expose them to the varied solutions they might have for a given challenge,” tells Guru prasad K. Rao, Director-Technology and Operation, Imaginarium. The technology is suited to project works, where learning arises naturally as part of a research. It will benefit teachers to focus on teaching concepts in-depth like the Physics and Maths teachers engaged with the use of the printers to promote thinking, reasoning and understanding of their subject. The usage of 3D printing at school level allows teachers from other STEM areas to see how their subject could make use of the technology. Not only this, it also helps to improve students’ learning and brain development. This technology encourages creativity and technical skills of students, develop interest in art and design aesthetics, foster students’ personality and confidence. “Novabeans provides comprehensive 3D printing training courses to students, professionals, architects, managers, doctors, engineers, designers, hobbyists, teachers, learners and anyone who want to learn and enhance their CV and professional skills and find potential business opportunity in new industry. We are helping schools and colleges to adopt technologies in a most cost effective manner, so that the educational institutions are able to provide a platform to enhance learning and shape student’s future,” says Gaurav Loyalka, Co-founder, Novabeans. Also with the increasing number of manufacturing companies adopting 3D printing for benefits beyond just prototyping, like concept modelling, advanced prototyping, final production parts, to name a few and the convergence of manufacturing and innovation in education, 3D printing is becoming more crucial to curriculums. “It equips the students, especially the future designers and engineers, for careers being reshaped by 3D printing like medical, consumer goods, research & development, automotive, electronics among various others,” feels Bajaj. 3D printing has been evolving very rapidly in last couple of years. The printers are getting more advanced, quicker and even making use of several materials to make 3D printed materials. 3D printing is a disruptive technology and will see a huge impact on manufacturing, logistics, education and healthcare. 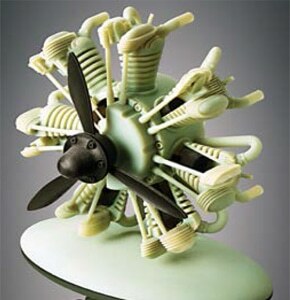 However, a 3D printer is still not ready to self-re-create, therefore, the most widely and cost-effective 3D printing process is called Fused Deposition Modelling (FDM), many call it differently, but fundamentally it allows plastics and plastics-related material to be heated up and a filament extrudes thin layer of plastics to build a model layer by layer. “We offer complementary 3D printing technologies designed for a range of applications, striving to be a powerful partner in the product development department, in classrooms and labs and on the production floor. FDM Technology is the only professional 3D printing technology that uses production-grade thermoplastics, so, parts are unrivaled in mechanical, thermal and chemical strength. 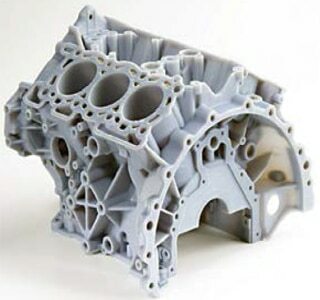 While our PolyJet technology is a powerful additive manufacturing method that produces smooth, accurate prototypes, parts and tooling too produce thin walls and complex geometries using the widest range of materials,” informs Bajaj. Indian printing industry is growing at a rate of 20 per cent per annum and the current annual turnover of the industry is 50,000 crore. The market has made significant advances in developed countries like US and is poised to grow in India strongly. According to 6Wresearch, India 3D Printer Market is projected to cross $79 million by 2021. The report says, automotive application accounted for majority of the revenue share in India while the educational and medical applications are witnessing higher growth too. Other niche applications like arts and crafts, interior decoration, fashion accessories, footwear designs, jewelry designs, animation & gaming, customised footwear designs, furniture and modeling have potential as well. It is clear that 3D printing is in its early stage of adaption in India. Most of the3D printers are in technical learning, mechanical, engineering and manufacturing field. “In India, 3D printer market is one of the emerging markets, where demand is primarily exhibited from Tier-I cities. 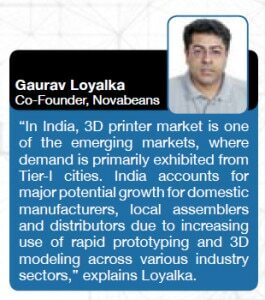 India accounts for major potential growth for domestic manufacturers, local assemblers and distributors due to increasing use of rapid prototyping and 3D modeling across various industry sectors,” explains Loyalka. Amongst all 3D printing technologies, FDM technology-based 3D printers dominate the overall market. Low cost and ease of availability of these printers have given them a major share in the market revenues. SLA – Resin printer will pick as the price will start to go down. The education market is best suited for 3D print technology as a way to better engage students. Prime Minister Narendra Modi’s Make in India drive has pushed the demand for 3D printers among the institutes and every production center needs one to refine their products and designs further. The Microsoft’s Windows 8 will also support 3D printing, which is an excellent sign for the emerging 3D printing economy and Microsoft’s support could signal the rapid move propelling 3D printers into mainstream educational environments. No doubt the market for 3D printers is poised to grow in India, but currently the adoption is still at an early stage when compared to other parts of the world. “In India, we expect automotive, defence, education, aerospace, medical, dental, industrial machinery, R&D and manufacturing to be the largest implementers of 3D printing. Creating physical prototypes of products help companies evaluate and validate the product designs physically, testing them for fit, form and ergonomics. Designing errors can be detected early and addressed immediately, reducing the cost and time of design reiterations, considerably,” opines Bajaj. “We believe educational institutes (secondary education to Higher studies) wherein top 200 schools and colleges would be having some kind of 3D printing set up in next 1-2 years. Now, most of the top 10-20 technical institutes would be having dedicated 3D printing set up for students and faculty for research purpose. 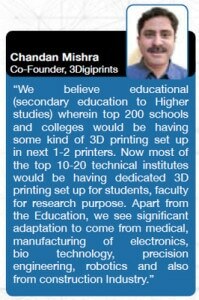 Apart from the education, we see significant adaptation to come from medical, manufacturing of electronics, bio technology, precision engineering, robotics and also from construction Industry,” believes Chandan Mishra, Co- Founder, 3Digiprints. “The key to the success of adaptation of 3D printing is content. The content will come once we have a culture of making things in simple terms to create and design. This is the most significant part of the success of 3D printers involvement in India. This would mean that we have encouraged students, professionals and others to start making 3D designs in computers. This is a huge impetus to the manufacturing growth. Once we have achieved this benchmark of designing in India, we will see a huge growth of 3D printing technology in most of the mainstream Industries,” says Mishra. The technology is becoming more attractive for the educators who acknowledge its usage in the field of designing, computer, mathematics, technology and crafting skills. This multifaceted technology will help students to be ahead of the technological curve as the industry of 3D printing grows. Unlike its utilities, the real success of the 3D printers depends upon the adoptions in the market and the real customers. For this, awareness and understanding plays a major role. But there are other factors contributing to make it an effective technology for the education sector. The whopping cost of the 3D printer, evolution of materials’ research, non availability of skilled manpower for imparting training and knowledge, time consuming, lack of DIY culture are few of the factors affecting the success of 3D printers in India. “Technologies with simple and robust design, readily available materials, 3D content, price, and technical support are the factors affecting the success of 3D printers. Also, there are a few factors that could greatly fuel the demand for 3D printers in the Indian manufacturing market. Some of those include training centres for faculty, and a good governmental policy to promote them,” shares Rao. It is clear that the use of 3D printers will not instantly change the teaching system, course and lesson plan unless it is being fully adopted by the education sector. Teachers require rigorous training and time to make it more effective for students and schools need time to integrate the technology into the curriculum. An innovative use of the 3D printer is the need of the hour. Encouraging and supporting teachers to use this new technology will help disseminating knowledge to students. Accessibility of the machine in a school and pupil motivation to use it is another factor. Despite being encountered with several factors, today, 3D printers can not only handle materials ranging from titanium to human cartilage, but also produce fully functional components, including complex mechanisms, batteries, transistors, and LEDs. Make in India campaign which started in 2014 is anticipated to drive the future growth of the market. India will give more emphasis on local manufacturing, 3D printing will become mainstream. India has remained predominately a service economy. But this can change due to the advancement of 3D printing. The technology will certainly help bringing manufacturing jobs back to India. If government is serious about ‘Make in India’ they should proactively promote 3D printing industry.